Not that this should come as a surprise to anyone, but a convertible Jeep Wrangler, -14 degrees (temp at home this morning) and 60+ MPH speeds make for a chilly drive. I think the term suboptimal came to mind this morning. Convertible Jeep Wranglers like mine have half doors with removable "convertible" tops. At high speeds these doors tops have a habit of flapping (pulling out from the vehicle) and sometimes leaving a gap of almost a centimeter. That's a lot of wind at 60+, and given the temperature, that was some seriously chilly air. Most mornings I start the Jeep and let it warm up and it's fine for the drive; I can even take off my jacket and wear just a shirt. Credit to Chrysler for figuring out how to put actual heaters in Jeeps unlike the old Willys/AMC Jeep days. Not this morning however. I was never able to take off my coat, and kept bundled up the entire time; the heater simply could not keep up with the heat escaping the rag top. More than anything this emphasizes my search for a new daily driver, not that I am having any luck with that at all. Nothing I like meets my requirements; at least nothing available in this country. It's quite frustrating looking up a vehicle here and find the perfect car but it's not available with a manual transmission; then going the UK website for the same company and looking at the same vehicle and it is available with a manual transmission. Available in most other markets as well, so I know left hand drive versions are being made with manual transmissions; just not for sale in the US. Almost every vehicle I like that's has no manual option here I can find with a manual and a turbo diesel in Europe. I like the idea of a decent vehicle with a real transmission and getting 40+ MPG. Ok, so it would likely only get mid-30 MPG on American diesel; that's still ok for an SUV/crossover as opposed to the high-teens to low-20s they here get. So, the search continues and doesn't look to have a positive outcome in its future. 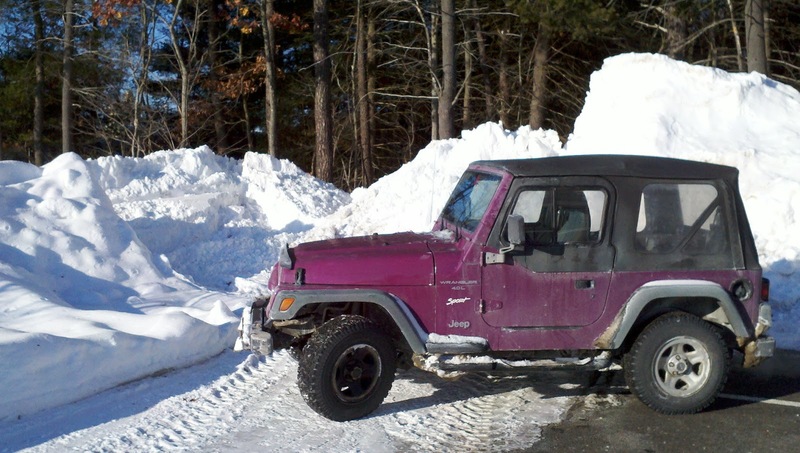 I'm probably going to have to just get another Jeep, but with a hardtop and full doors, so it seals against the wind. Also, this picture really shows how small those tires are. It definitely needs a (minimum) lift kit and the 33x10r16 BFG Mud Terrain tires that I am looking to put on it. I want to do a bunch of other mods to it as well, but I think the suspension and tire situation needs to be addressed first; well, once I get the new daily driver situation settled, of course. 33" tires are not very good for commuting (been there, done that; not ideal).